You might know that I would include an American Impressionist in the American artists’ month. Frank Weston Benson is one of my favorites, because I love his portrait of his daughters at the Worcester Art Museum. Born in Salem, Massachusetts, he studied painting at the MFA School in Boston, and then in Paris. While he did not immediately convert to painting outdoors, he was drawn to the French Impressionists’ interest in the effects of light on local color (the color of the object). His light-struck portraits of the 1880s and 1890s eventually led to his exploration of painting subjects outdoors in full-blown Impressionist mode in 1899. 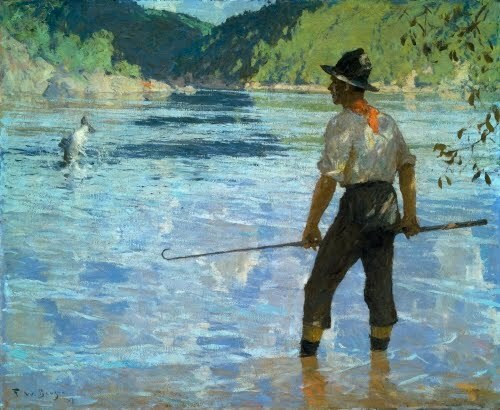 It may have been his exposure to salmon fishing (of all things) that led him to explore more seriously painting outdoors. His first trip to the Gaspé Peninsula (Québec) in 1895 turned him on to the joys of salmon fishing. During the first thirty years of his career, he rarely painted scenes of people hunting or fishing. After being exposed to salmon fishing in Canada, it even led him to explore the use of the portable medium of watercolors—a medium which he had denigrated as amateurish—because it allowed him to paint during long trips away from his studio. Salmon Fishing is one of a long series of works—watercolor, charcoal drawing, and oils—of his favorite spot on the Grand River and Bonaventure River in Canada. His paintings that resulted from his manly hunting and fishing pursuits included scenes from Long Point in Ontario, the backcountry of Maine, the Chesapeake Bay, Cape Cod, and fishing trips to the Florida Keys. One of the most evocative aspects of Benson’s gorgeous en plein air paintings is his depiction of the nuances of light and color in water, and well as reflections in the water. The second most spectacular aspect of Benson’s work is his depiction of dappled light. He mastered this quite early in his career in his portraits of his daughters. I first showed you Preston Singletary’s work back in 2009. This native of Washington state, a member of the Tlingit Aboriginal group, is one of the most fascinating glass artists ever. He may have been grounded in traditional glass blowing that he learned in the European glass capital Murano, Italy (near Venice), but his work far transcends merely blown pieces. He’s been at it a long time, having started glass-blowing right out of high school. It was the foundation on which his current work is built, which is stunning. He has incorporated Tlingit subject matter, forms, and symbolism into a basically Western medium; and totally made it his own. This piece beautifully displays one of Singletary’s techniques that I find so interesting. After blowing glass, he applies powdered glass of different color onto the glass bubble he’s blowing. After it cools, the glass is wrapped in rubber tape, onto which a design is drawn. The stencil is cut with an art utility knife and the piece is sandblasted through the different layers of glass to reveal underlying color. For the Tlingit, the orca (killer whale)—or “black fish”—is a medicine animal. The Tlingit have never hunted the killer whale because it is considered a protector of humankind. 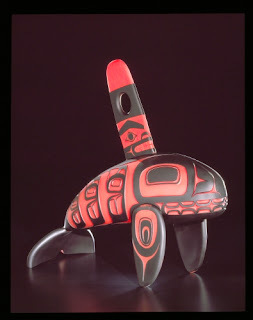 As a clan animal, seen in totems, the orca represents power and strength.